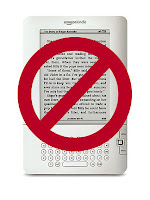 Caroline Bookbinder: EReaders: Still No. What a difference a year makes! I remember at a book club meeting last summer, our one Kindle-owner passed her Kindle around, showing it to everyone. At our most recent meeting, I was the only person without one. Even the one woman who had checked the book out of the library owns a Nook (not sure why). They were pretty evenly split with 2 Nooks, 2 Kindles, and 1 iPad. They discussed advantages and disadvantages of Nook vs. Kindle, backlit vs. eInk, whether the backlit ones keep their husbands awake at night (verdict: the husbands complain but are asleep within seconds), and how to change the screensaver image. Meanwhile, I admired my book jacket. In fact, everyone did. My book kept getting picked up and cooed over and passed around. While they seemed amused by my quaintness, they also missed not seeing the cover fully (sure, there's an image of the color but you can't see the spot gloss and the spots of gold and the raised lettering), they laughed over never knowing what page they're on, and one woman mentioned she never can keep rack of authors' names anymore, since she doesn't look at the book cover but once, instead of daily for several days like you do with a print book. Now I'm not known as a Luddite and I am known as one of the better-read and more knowledgeable in our book club about the book industry, so more than once surprise has been uttered that I don't have and don't intend to get an eReader, especially now that I have a long overseas trip coming up this summer. But I don't. And the simplest answer is just, I don't want one. Beyond that, my second reason is pretty basic: I have over 250 books in my house that I haven't read yet. And unlike with my iPod and CDs, I can't load them onto an eReader. So I need to get through those books first. Which is never really going to happen since I keep adding to my bookshelves. But that is the most practical reason. Also I don't feel like shelling out hundreds for a gadget that isn't even a book itself (I'd have to pay more for actual books) and could easily be lost, stolen, or broken. And how do you decide what to read next? I like to stand in front of my bookcases and pull books out and read the backs of them and make a little pile and then put most of them back. Can you make a virtual "pile" of your online TBR books? Also, what would I do with all my bookcases? I think books are a wonderful addition to any decor. Not to mention sometimes an invaluable hint to a new friend's personality (ah, the boyfriends who I thought much differently of after perusing their books!) They work in bright sunlight, with low lights at night, don't run out of charge, and I can loan them out or give them away. So for my long overseas trip I am going with the same tactic I did for my cruise last year, and I have been accumulating thick mass markets from the used bookstore. I will be happy abandoning these books in airports and elsewhere abroad, I didn't pay much for them in the first place, and most of them look like fun. Oh, and here's one more thing you can do with a book than you can't with an eReader: a friend and her husband were flying to Scotland and about a half-hour into the flight, she decided she detested her book and just couldn't go on (this is one reason why I always bring way more books than I could possibly read.) The in-flight magazine wasn't going to keep her entertained for long. The movies didn't interest her. She wasn't about to just stare at the seatback like Puddy. She asked her husband if he'd trade books but he'd heard her report on her book and declined. She asked him to just give his book to her, but he'd be left in the same predicament so refused. Then came the brilliant idea! He was about half-way through his book and it was a mass market (this wouldn't work with a hardcover and wouldn't work easily with the larger trade paperbacks). So he ripped it in half, and gave her the first half while he kept reading the second half. Problem solved! Good call! I succumbed to the lure of the Kindle, thinking it might help me curb my rampant book-buying, but I HATED IT. I didn't know whereabouts in the book I was, and I found I wasn't remembering things as well because I couldn't easily flick around, so I had no sense of the book as an object. (You know, I remember that X happened about halfway through the book, on a left hand page, a few lines down...) The Machine is now deregistered and I've happily returned to my lovely paper books, with renewed enthusiasm and a lot of affection! I still don't have an eReader either, and if I did get one I still wouldn't give up regular books. The eReaders do seem convenient in a lot of ways (I mean, how many trees do we cut down to print all those books? ), but you make some good points about not having the constant reminder of who the author is, and Ellie makes a great point about not being able to flip back for a reminder. I'll wait until I get one before I come to a verdict, I guess. Well, I do have a Nook since my husband gave me one for some occasion last year (my birthday I think). Ask me how many times I've turned it on? Now ask me how many books I have on it? And how many have I read on it? I can't be too negative about it because it was a gift from the heart from him but it definitely wasn't something I'd have chosen myself and it won't see much (any?) 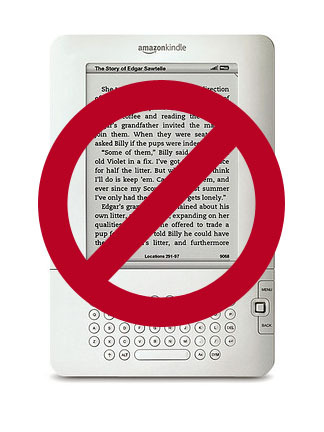 use because I just don't care for extended e-reading. Every Christmas and birthday I am so scared I'm going to get one from a well-meaning but misguided loved one! If it's a Nook I'd probably keep it but if it's a Kindle I'd have to return it. I only really bought my Kindle for review copies that I got in ebook format. I don't buy much for it and if I love a book I read in electronic format, I'll buy a paper copy (unless it's really ugly looking). I agree, I forget author names and struggle with not being able to see where I am, but if the books good, it'#s good however I read it. Sometimes ebook is the only option and I'd rather have it on an eInk screen than backlit on my laptop any day.